State news agency KCNA said leader Kim Jong-un signed off on the order at a late-night meeting of top generals. The time had come to "settle accounts" with the US, KCNA quoted him as saying, with the B-2 flights an "ultimatum". 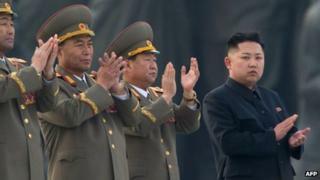 Pyongyang has been angered by fresh UN sanctions and annual US-South Korea military drills. Russia said it was concerned by "unilateral action being taken around North Korea" and warned against the situation slipping out of control. China, North Korea's biggest trading partner, has called on all sides to ease tensions. Kim Jong-un "finally signed the plan on technical preparations of strategic rockets of the KPA, ordering them to be stand-by for fire so that they may strike any time", the KCNA report said. At present, the risk is not one of large-scale war or nuclear attack, but one of miscalculation. North Korea continues to search for new ways to issue threats - partly in an attempt by the regime to consolidate power at home, and partly in the hope that the US cancels its exercises as President Clinton did. As Pyongyang does so, the West calls their bluff and continues to carry out drills and B-52 flights over the peninsula. This concerning pattern occurs in the absence of any regular engagement between the US and North Korea. Should it persist, the risk of miscalculation by either side will rise. "If they make a reckless provocation with huge strategic forces, the Korean People's Army (KPA) should mercilessly strike the US mainland, their stronghold, their military bases in the operational theatres in the Pacific, including Hawaii and Guam, and those in South Korea," the agency quoted him as saying. Thousands of North Koreans later took part in a march in Pyongyang in support of Kim Jong-un's announcement, the Associated Press news agency reported. A Yonhap news agency report citing an unidentified military official said increased activity had been noted at North Korea's missile sites, but this remains unconfirmed. The US - which flew two stealth bombers over the peninsula on Thursday as part of the ongoing military drills - has said it is ready for "any eventuality" on the peninsula. In a statement, it said that the B-2 planes demonstrated America's ability to "provide extended deterrence" to its allies and conduct "long-range, precision strikes quickly and at will". "The North Koreans have to understand that what they're doing is very dangerous," US Defence Secretary Chuck Hagel told reporters on Thursday. "We must make clear that these provocations by the North are taken by us very seriously and we'll respond to that." The US flew nuclear-capable B-52 bombers over South Korea earlier this month, in what it called a response to escalating North Korean threats. 28 Mar: US flies stealth bombers over Korean peninsula; showcasing ability for precision strike "at will"
In Beijing, Chinese Foreign Ministry spokesman Hong Lei reiterated a call for calm on all sides. He told a daily news briefing that "joint efforts" should be made to turn around a "tense situation". He made similar remarks on Tuesday. Russian Foreign Minister Sergei Lavrov condemned Pyongyang's actions as "unacceptable", Interfax news agency said. He later told reporters that Moscow was concerned that "alongside an adequate reaction from the [UN] Security Council... there are unilateral steps being taken around North Korea". "We may simply let the situation slip out of our control and it will slide into a vicious spiral." Tensions in the Korean peninsula are high following North Korea's third nuclear test on 12 February, which led to the imposition of a fresh raft of sanctions. North Korea has made multiple threats against both the US and South Korea in recent weeks, including warning of a "pre-emptive nuclear strike" on the US and the scrapping of the Korean War armistice. North Korea is not thought to have the technology to strike the US mainland with either a nuclear weapon or a ballistic missile, but it is capable of targeting some US military bases in Asia with its mid-range missiles. While North Korea has issued many threats against the US and South Korea in the past, this level of sustained rhetoric is rare, observers say. On 16 March, North Korea warned of attacks against South Korea's border islands, and advised residents to leave the islands. In 2010 it shelled South Korea's Yeonpyeong island, causing four deaths. On Wednesday, Pyongyang also cut a military hotline with the South - the last direct official link between the two nations. A Red Cross hotline and another line used to communicate with the UN Command at Panmunjom have already been cut, although an inter-Korean air-traffic hotline still exists. The jointly-run Kaesong industrial park is still in operation, however, and over 160 South Korean commuters entered North Korea yesterday to work in its factories. The complex employs an estimated 50,000 North Korean workers and is a source of badly-needed hard currency for the North.